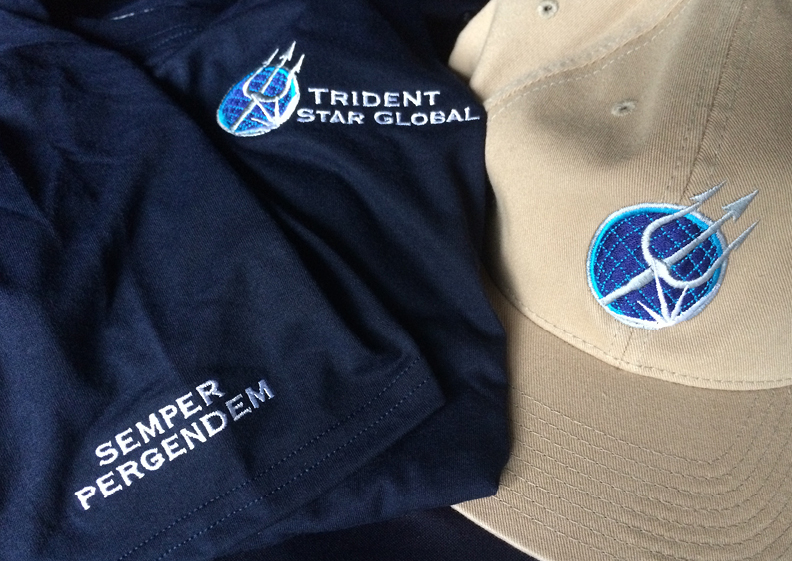 Trident Star Global, a specialist in mobility and security solutions in remote locations, already had a logo and website. The company was ready to refocus their brand on a certain set of skills and wanted a brand refresh to go along with that. They hired Katy Dwyer Design to redesign their logo and business cards to create a more consistent brand across their many marketing efforts. Trident Star Global had an idea of what they wanted in their logo. KDD took those ideas into account and worked to design and illustrate a clear, bold brand. Business cards, letterhead, powerpoint presentation templates and proposal templates were all part of the initial design package. Company apparel and tradeshow graphics were also needed to help promote the new brand. Since Trident Star Global is an international business and presents all over the world, KDD put together a trade show package that was light, durable, and easy to travel with. We also got them set up with performance apparel for representatives of the company to wear to promote a clean, polished image anywhere they go. The last step in rebranding was redesigning their website. Trident Star Global needed a website that both reflected their global offerings, and clearly spelled out the three different types of services they offered. KDD designed Trident Star Global’s custom-built fully-responsive WordPress website that launched in Spring 2015.